My twin brother Alex and I started High School in 1971. University High School in West Los Angeles. By the time we started there, we were coming out of an early adolescent obsession with all things rock 'n roll and moving into a new world of jazz/rock (it wasn't called "fusion" yet) and avant-garde jazz/free jazz. Our earliest rock obsession had inevitably caused us to be ostracized by all of our elementary school friends because of my brother's insistence on playing the Mothers Of Invention song "Brown Shoes Don't Make It" for a friend who was so offended and disturbed that he told all of our friends, who then in turn refused to ever speak to us again! Junior High School was far more social as we found many like-minded friends and indulged our musical searching, eventually discovering Coltrane and Miles, which concomitantly initiated a new, more subtle drift from our crowd as we entered High School with a decreasing enthusiasm for certain sounds of our past. This eventually became isolating. But along the way we met a boy with taste similar in many ways to ours, though much closer to that of my brother Alex's than to mine. This rather alien boy was Lee Kaplan, and he routinely wore nightshirts over long-sleeved T-shirts to school - the first person by far to ever sport what was called, years later, "the layered look" - as well as stylish cuffed corduroy bell bottoms. Like Alex, he was really into King Crimson and Pink Floyd. He was also the first person we knew to embrace "Glam Rock", and was really into David Bowie, Roxy Music, and T Rex. We would later learn that he was a total Anglophile when it came to rock music, and owned tons of obscure import records by bands like Caravan, Hatfield and the North, Soft Machine, Patto, Henry Cow, Family, Tempest, Colosseum, as well as records by Yes and Genesis, which we had not heard yet (remember - this was 1971). Lee was also an aspiring bassist and had a super cool Gibson EB-3 bass and a monstrous Acoustic 360 bass amp - the baddest gear we had ever encountered. So it only followed that we would try to play music with Lee. The ensuing years saw a lot of music making and a lot of sharing, changes, conflicts, and mostly growth in various directions and of various stripes. It wasn't really easy to make music regularly with Lee; he didn't always practice, and he was also an aspiring music writer, eventually writing under the name Leigh Kaplan for Phonograph Record Magazine and hustling amazing amounts of promotional materials from record labels (in an era of crazy and marvelous record company excess): T-shirts, press kits, limited edition promo runs, etc., all meticulously filed and all acquired from hitch-hiking runs into Hollywood, which seemed to us to be 50 miles away from suburban-esque West L.A. This endeavor led Lee to befriend an astonishing number of music writers and label schmos of the day. It also led to what I am about to describe in terms of what one can do armed with sheer will, some sort of focused desire. As I look back, I am astonished as I attempt to explain what became a profound aesthetic and stylistic change in our alien boy Lee. It somehow happened that, after being exposed to the avant-garde side of jazz improvisation by Alex and me, Lee began to become super-absorbed in music that was, far from being made by weedy UK aesthete rocker conceptualists, made by African Americans, though eventually Lee discovered, sort of accidentally, the British and European avant-garde himself and turned us on to them! But picture this if you can: When we played our only gigs with our band at lunchtime (all-instrumental music drawing on King Crimson, electric Miles Davis, Tony Williams Lifetime, Weather Report, et al, though rather primitively, of course), Lee would wear his platform boots, maybe a fur boa. After all, his style icon was Brian Eno (then only known as Eno). Bowie, too, of course. I was, at first, steadfastly denim, but gradually I drifted into football jerseys to mimic my hero Leon Russell, and I even got some cuffed bell bottoms. But until Lee blew my mind with "The Yes Album" and "Fragile", I was pretty much an Allman Brothers Band/Rory Gallagher/Johnny Winter blues/rock kind of guy. Alex was always far more "out there", embracing not just "Crimso" and "The Floyd", but Zappa and Beefheart early on, and now Eric Dolphy, Art Ensemble of Chicago, Sun Ra… Anyway, our glam rock alien bassist started to become an almost fanatical fan of (I will attempt to list in order of love) Anthony Braxton, Sun Ra, Art Ensemble of Chicago, Oliver Lake, and Gunter Hampel/Jeanne Lee. Lee had skipped a grade at one point, smart alien lad that he was/is, so though only one month younger than Alex and me, he graduated High School a year ahead of us, going to UCLA to study…Egyptology?! By the time Alex and I played our senior lunch period recital out on the field to a mostly apathetic crowd, Lee was starting to embrace the electronic music side of improvised music of that time, acquiring a Random Resonator (just like on Herbie Hancock's "Rain Dance"!) and beginning a friendship with modular synthesizer innovator Serge Tcherepnin. He had become galvanized by Musica Elettronica Viva synthesist Richard Teitelbaum from hearing the Anthony Braxton album "Trio and Duet" (on Sackville), and was now leaning towards more electronics than bass - which I encouraged, since I was never sure whether Lee was all that serious about playing bass, even though he had acquired a decent upright bass and was digging Dave Holland, Barre Phillips, Malachi Favors, Gary Peacock and the like very heavily. But what Alex and I viewed as his lack of commitment really became difficult for us. Plus, Lee was often "difficult", evincing often cutting "humor" and sarcasm, sometimes in a hurtful way. Chalk it up to alienation combined with intelligence or whatever you will. Christ, we were teenagers! But I have digressed enough. Have you pictured the boy in the platform boots and boa? Now flash forward only a couple of years to Lee Kaplan at…20? By the time Lee was working at our favorite local underground record store Rhino Records (where he eventually got me a job), he was almost always shoeless, wearing tattered bell bottom blue jeans, and had a mass of hair that, while not fully Reggie Watts, was going in a similar though more random direction. He also began carrying around a plastic gallon jug of Arrowhead water - ALWAYS - decades before we all trod the Earth with our little plastic bottles of H2O. It was a bit odd, in retrospect, just as now NO ONE in Los Angeles or anywhere walks the city streets consistently barefoot. At the time - this was, remember, the post-hippie era - it just seemed a bit eccentric. Lee not only turned me onto Yes/Steve Howe (life changing), but he had randomly (ever the import fiend) bought the now-legendary and rare "Topography of the Lungs" by Evan Parker/Derek Bailey/Han Bennink (the first Incus record) on sale at Vogue Records in Westwood because "it looked weird", and played it over the phone for Alex and me (it sounded like a cat fight in an industrial drum - we said "we'll be right over!"). He also bought the early Jan Garbarek Quartet record "Afric Pepperbird" - probably at Moby Disc in the distant San Fernando Valley - and played Terje Rypdal's skronks over the phone ("I'm coming right over! "), thus setting us all on the ECM trail for decades hence. We were voracious. I must note, before I write about a few of the concerts I attended from those days that seem to stand out in my now age-compromised memory, that Lee's belief in and promotion of my brother Alex's and my talents was unshakable. I have, a few times, referred in interviews to Lee as a "loud-mouthed friend" because every time he would meet someone notable or sympathetic at the record store or anywhere he would say to him or her, "You should play with my friend Nels" or, "You should hear my friend Alex play drums." He said this to Vinny Golia when he ended up chatting with Lee at Rhino in around 1975. The first record I ever ended up playing on was Vinny's second record "Openhearted", and Alex played with Vinny for over 25 years (!). He said it to Charlie Haden - one of my absolute musical heroes of that time - and eventually I ended up playing in his Liberation Music Orchestra West Coast from 1982-1986, as well as playing a duo concert and trio (with Bobby Bradford) gig. He suggested to Julius Hemphill (among others) that he use Alex in his trio (see below) which indirectly led to my playing with Julius (along with Alex) from 1983-1986. Most crucially, while strolling through the practice rooms at UCLA, he heard a long-haired young man playing Chick Corea's "Song of the Wind" on piano, and told him he should meet Alex and me. That young man was Eric Von Essen, who would become my musical partner and mentor for almost 17 years. But for the record, Lee's voice was anything but loud. I don't think I ever heard him yell - even when Alex and I were yelling at him like insane children at a "rehearsal". And it was because Lee suggested it that we all ended up jamming with Oliver Lake in the back room behind my parents' house in…1977? So as I hung out last week with Henry Kaiser, Wayne Horvitz, and Larry Ochs, it once again occurred to me that these comrades and so many more were really made possible by Lee Kaplan. In those days I was utterly incapable of even telling someone potentially skilled, let alone legendary, that I even played. An example of my tongue-tied paralysis comes to mind: one bright day in the late 70s Carla Bley strolled into Rhino to check on how things were going with the New Music Distribution Service, which she oversaw and which distributed almost all the free jazz and contemporary composed music of note of that time. I was severely fixated on her and her music in those days, as well as being a fanatical fan of her ex-husband Paul Bley's music. Lee was the "jazz" record buyer back then, and it was his day off, but he was summarily called at home and he came zooming over to chat with her. I had just been standing at the counter slack-jawed for an hour, never saying a word to Carla, who was just so funny and charming and, well, HOT, as she puffed on her little meerschaum pipe (the only person ever allowed to smoke inside Rhino Records, I think). Lee finally turned away from Carla to me and said, "of course you have met Nels. He's a huge fan of yours," and when I looked panicked and said nothing Lee gave me a look I remember so well. It said, "Seriously?! You are totally LAME!" And he was right, of course. Without Lee's tireless and unsolicited proselytizing on my behalf I am not sure I would have ended up doing even half of what I did between 1977 and 1987. Seriously. Back to The Century City Playhouse we go. I was working the door at most of the concerts that happened on most Sundays in that little black room from the late 70s to early 80s. I would often come after work from Rhino. I still have no idea how Lee found a lot of these people or if they eventually found him, but a lot of up-and-coming younger improvisers played at the series, including Henry Kaiser (with, I think, saxophonist Henry Kuntz of Bells Magazine, the rather doctrinaire Bay Area free jazz printed soapbox), John Oswald (with Henry? ), Wayne Horvitz (then going to UC Santa Cruz and playing in a sort of neo-Henry Cow/Curlew type of ensemble called White Noise), Davey Williams and LaDonna Smith, Marty Ehrlich (fresh out of the New England Conservatory, played twice - once in a rather Hemphill-inspired solo-with-tape performance and later in a trio with Alex and John Carter) as well as those you will see mentioned below. Lee's phone bill must have been huge, and he was not rolling in dough, needless to say. But here are some notable moments from the Century City Playhouse concert series, as filtered through my fuzzy/selective memory. These are, mind you, only a handful of events of many, and it must also be mentioned that it was during this series that the collective Quartet Music (Eric Von Essen, Jeff Gauthier, Alex, me) played one of its first concerts, that Vinny Golia got a chance to try out various ensembles, and that a lot of other less famous but no less forward-looking and fabulous musicians such as Wayne Peet and John Rapson did some of their earliest work. I have no clue how Lee found Oliver Lake and got him to Los Angeles, first solo alto saxophone and poetry, and later with the great guitarist Michael Gregory Jackson, then probably in his mid-twenties. Oliver Lake was and still is, to my mind, one of the true greats. Lee, Alex, and I were super revved up about "Heavy Spirits", the first record of Lake's that we heard, and later by his solo recording "Passin' Thru", on which this concert was based. He had also published a chapbook of his poetry called "Life Dance." It's worth noting that musicians like Oliver Lake, Julius Hemphill, Anthony Braxton, Leo Smith, Leroy Jenkins, Milford Graves, Sun Ra, et al were ARTISTS. They did more than just play music. They often presented multimedia works, collaborated with dancers, did spoken word, invented their own systems of notation… Oliver playing and reading poems like "Put All My Food on the Same Plate" (if that's actually the title) was completely inspiring. To this day, no one sounds like Oliver - quite a feat on the alto saxophone. When he returned with Michael Gregory Jackson, the chemistry was amazing and MGJ was already doing almost everything I was striving to do. How inspiring and simultaneously daunting! Our old friend Bruce Bidlack recorded the event, and a beautiful solo acoustic guitar piece by Michael from that recording ended up on his first (and superb) album under his own name. The estimable flutist was just out of Pomona College and had released his first record himself (which we all basically were doing, like our "loft jazz" forebears) which was recorded by our old friend Bruce (again). It was only a few years later that James and David Murray, both students together out there in Claremont, would become two of the hottest voices on their respective instruments on the European tour circuit, releasing dozens of records. James' sound then was already massive. I had heard him earlier (along with David Murray, Mark Dresser, and Bobby Bradford) in Stanley Crouch's Black Music Infinity (back when Mr. Crouch was into the "free jazz" he later disparaged), and it was apparent then that James was soon to launch. I also do not know how Lee found Julius Hemphill, one of the greatest composers and woodwind players of this or any other music, but he did. Apparently Julius was on his way to play up in Berkeley at a place called Mapenzi, and he wanted a recommendation for a drummer. Lee suggested Alex and the rest is, as they say, history. Alex in this period had a massive drum setup reminiscent of his hero Sonship's set combined with that of two other heroes, Don Moye and Frank Perry. He was full of nonstop fire as well as sonic subtlety. Julius just loved Alex's playing right away, and they ended up playing together up at Mapenzi, as well as later in Philadelphia (with cellist Abdul Wadud), and on a rather ill-fated European tour. Alex was, I think, 22 years old. This trio ended up being called "The Janus Company", which even recorded in New York City, but that recording is apparently lost forever. They were super fiery, with the amazing Baikida Carroll, himself a frequent collaborator of Julius' and fellow (former) member of St. Louis' B.A.G. (Black Artists Group) in amazing form. This trio was what many rock writers around this period would tiresomely refer to as "incendiary". That's right, all the way from England, the king of extended techniques, the master of a whole other form of saxophone playing, played the Playhouse. This was the perfect venue for this, I feel. The hard, black walls of the Playhouse were the perfect environment for Parker's soprano saxophone especially. He would do sputtering, growling, splintered bursts of tenor, but circular breathing on the soprano as he investigated the uppermost partials of the instrument, slightly swirling it in a circle to create incredibly hypnotic and almost incredible sonic effects. Completely mind-blowing. I had become aware of Eugene Chadbourne because he was A) a guitarist, and B) a collaborator with Henry Kaiser, among others. This was Chadbourne before Shockabilly. John Zorn was completely unknown to me then. Somehow, they ended up playing two nights - Sunday and Monday - not sure why. But so many things impressed me about these gigs, some of them not even about the music. Eugene, seated, played an acoustic guitar (in a chipboard case) with thumb piano tongues attached to it, and he licked/rubbed it with all manner of objects, including a balloon and a huge wad of old guitar strings (amazing sound). He wore all white, looking like a milkman. John, standing, played alto and curved soprano saxophones variously, which were on straps around his neck, and a Bb clarinet which he held between his legs when he wasn't playing it (!). More often than not, he had a handball stuffed into the bell of the soprano. He had long hair pulled back into a ponytail, strands of which would escape and hang down in his bespectacled face, and he wore a football jersey and cutoff jeans. At one point (I think it was Monday night), they seemed to come upon some sort of pattern, something like: Eugene licks balloon and rubs once on guitar while John makes a flutter-tongue squawk then Eugene shakes the wad of guitar strings as John changes to clarinet and hits a long tone then… some sort of pattern seemed to emerge and they gradually sped it up faster and faster. It was amazing. They were embracing aspects of what is now termed the European avant-garde improvisers' language, but it was also like some sort of disassembled folk music, possibly identifiable somehow as American. Remarkable. When I later learned that they were traveling by Greyhound bus with no change of clothes (wonder how white the milkman clothes looked by the end), I went from impressed to awestruck. This was a ridiculous night for yours truly, because for some reason I decided to get really drunk and stoned for this concert. I rarely drank any hard liquor in those days, but I somehow had dinner involving red wine then decided to move on to hashish and tequila, and tequila in those days meant - at best - the dreaded Cuervo Gold. What was I thinking?? I wasn't, obviously. As our hero Leo Smith (later Wadada Leo Smith and someone I have been fortunate enough to play with since that night) assayed his amazing use of dynamics, of space, with his incomparable tone, I sat in one of the theater seats in the back (the place barely seated 50) with Leo swirling around like a phantom as I became sicker and sicker. Inelegantly (to put it mildly) I excused myself at intermission and went and hurled copiously in the adjacent golf course against a tree. Gross! Then came back to enjoy more genius. I remember this all like it was yesterday! To this day, Leo Smith is one of the greatest solo players. He could even tear through my puerile inebriation! This was NOT a favorite concert of mine, yet it really stands out in my memory because of how aggravating, yet wholly original it was. It was an exercise in pure brattiness, in contrarian behavior. The legendary bassist Buell Neidlinger, he of Cecil Taylor collaboration and classical/session musicianship par excellence, played a Hofner Beatle bass and wore what I think may have been a mu-mu. I think there was a "primitive" female drummer (a friend/neighbor recruited for reasons of naiveté?) - I can't really remember. But then there was the estimable Marty Krystall, one of the great unsung tenor saxophone players in this music, playing like a man possessed even as they performed tongue-in-cheek vocal call-and-response numbers like "Columbian Cup of Coffee" ("Mrs. Olsen? Mrs. Olsen?"…). As I recall, Mr. Neidlinger played a goodly portion of the concert behind the black curtain. Bratty and - at the time - a bit infuriating. But memorable! The woodwind player from Frank Zappa's Grand Wazoo and the phenomenally subtle drummer I had heard on Monday nights at Donte's with an amazing iteration of the Joe Diorio Quartet - that was how I thought of this duo of amazing gentlemen who were not super well-known in Los Angeles as improvisers at that time, but they were so hooked up, often truly powerful. Kurt McGettrick was a really successful session player and really nice man. and Mike is ever the gentleman. I loved this duo. Kurt has passed away, but Mike is (last I checked) still playing with the Bennie Maupin Quartet and doing amazing work. Oh god… It had to happen. As huge fans of Sonny Simmons' double record for Contemporary Records called "Burning Spirits", we were super excited about this impending concert appearance by Sonny Simmons (alto saxophone) and his then partner Barbara Donald (trumpet) and their quartet. We had heard some pretty gnarly stories about Mr. Simmons' drug habit, but… Well, I guess it had to happen at least once, but the quartet (I cannot remember who the rhythm section was, sorry) drifted in at the very last minute. They were a mess. Then they rather belligerently insisted on ordering pizza. It got worse from there, but they did finally play, and the vibe was so dark and disturbing to me at the time. I even think they were staying the night in Lee's apartment! Oh man… Barbara Donald was a powerhouse on trumpet. Where is she now? I know that Mr. Simmons ended up homeless in Oakland and drifted around before landing on Qwest records, of all places, and making a pretty great record with Christian McBride on bass! But I hear he is still a mess…. 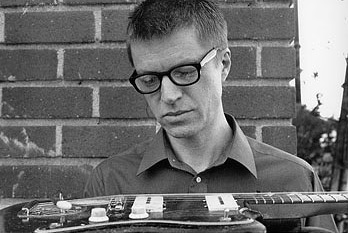 When Charlie Haden moved to Los Angeles to be near his kids, he came into Rhino Records and the die was cast: please play at the Playhouse! Lee got Charlie Haden to play with cornetist Bobby Bradford, a man whom we all loved and looked up to (still do!) and who had played with Ornette Coleman back in Fort Worth before Don Cherry did (Bobby went into the Army). I had met Bobby when I was eighteen and going to Occidental College and had heard his records with John Carter/The New Art Jazz Ensemble. We used to go to Sunday afternoon concerts at Rudolph's Fine Art Center to hear him and John with John Carter, Jr., Roberto Miranda, and William Jeffrey, and later to Bobby's storefront in Pasadena called The Little Bighorn. This was a great event, and Charlie was in incredible form. I was so lost in some sort of worshipful haze that my recollection of the concert was that it was pure beauty. Hearing those two play bop, Ornette compositions…. What a gift! What's the point of all this? Simply put, that if Lee Kaplan had not taken it upon himself to bring this music to Los Angeles, I and many others would NEVER have heard these great artists in that time period - a fertile and vital period. Lee even eventually got the Art Ensemble of Chicago to play Los Angeles, but in a bigger venue called Studio Z. Lesson: one person can make a huge difference. Lee ended up opening up an art book store called Arcana: Books On The Arts in the early 80s and it is still going. I worked there for eight years. He mostly listens to popular music, I think. I hear his large collection of Sun Ra/El Saturn LPs got water damaged. His Serge synthesizer? No clue. Time passes and things change. Lee changed so radically from the alien glam rocker to the barefoot boy into Braxton and then…more changes. We are all ever-evolving. But even through the haze of the past and memories of my petty insecurities and of personality conflicts and the like, I am so grateful to Lee Kaplan for not only bringing powerful and visionary underground music to Los Angeles, but also for believing in me and in my talent, even when I was barely "there". It just takes one!